How can I mount an action camera to a tripod when both have “out” tripod screws? It's typical to refer to "in" and "out" sockets and bolts as the, uh, biologically-inspired terms "female" and "male", respectively. So, the thing you are looking for is called either a male-to-male adapter or a male-to-female converter — same thing with two different names based on two different ways of looking at the problem. Assuming both devices have the same tripod thread, a male-to-male adapter like this one will do the trick. 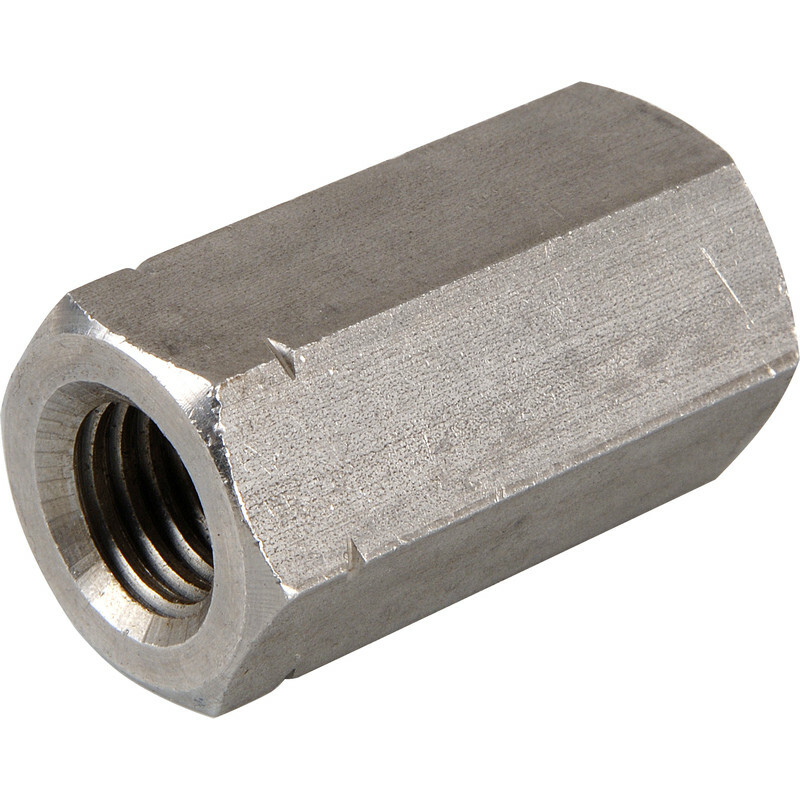 Or, if you need to convert between 1/4"–20 and 3/8"–16, there are plenty of double-ended adapters like this one which provide that. These are all cheap enough that if you're not sure, you could just buy them and experiment. There's also a small chance that your action camera has some weird idiosyncratic connector made for some other thing that same company sells. But this seems unlikely. If the thread of the camera is the same of the tripod, then you can use a connector nut. For better support you can make a small square of wood or plastic with a hole for the nut. The wood block should be as tall as the connector nut is long, sot it is flush on both sides when inserted into the block. Depending on the type of wood you may just pressure fit the nut if the hole is made of the right size, but epoxy glue or construction adhesive is also a good idea. A small block of aluminum, of similar size of your tipod's plate and little taller than the sum of both screws' protrusion. Drill a hole trough and use the right tread tap to cut threads in the hole. This way you can thread the block to the camera and the block would act as the normal underside of a camera with a conventional tripod mounting hole. If you don't have the tools or the materials, this is a pretty simple task for a machinist shop. They may even have a piece of scrap metal they can use to build the piece. The Voklano Action Camera cannot be directly mounted to a tripod because the camera body does not have threaded insert common to most other cameras. Many accessory mounts for this camera are sold separately. Looking at the camera manual on line: All mounting accessories attach to a waterproof plastic housing, available separately. Once so mounted, a helmet mount, a handlebar mount, a belt clip and other mounts are attachable. The online manual does not show a tripod mount. However, I think, if you are clever, you can mount the camera with waterproof case to a tripod using commonly available hardware. Not the answer you're looking for? Browse other questions tagged tripod tripod-socket or ask your own question. Does the Panasonic Lumix DMC-FT2/TS2 have a tripod mount? How do I fasten a Nikon D90 to a tripod head with camera alignment pin? Where can I get the tripod-to-camera adapter for my Nikon D90? How can I mount a camera and a fieldscope to one tripod? How do I repair stripped threads of a tripod mount? What can I use to shift a tripod mount to the side for easier access to the battery compartment? Have Tripod Screw Depths/Lengths changed over time?